This easy to prepare stew is a fall favourite. Serve with a green salad and whole grain bun for a warm-from-the-hearth meal. 1. Heat oil in a large oven-proof skillet. Add stewing beef and brown on all sides. 2. 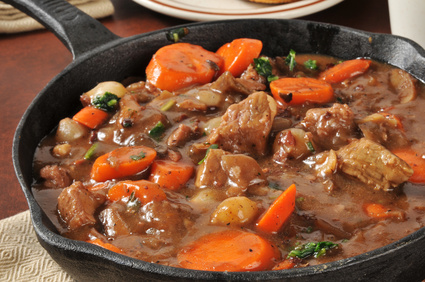 Prepare vegetables and add to the stewing beef. 3. In a bowl mix together tapioca, salt, sugar and tomato juice. Pour over beef and vegetables. 4. Cover skillet with foil and bake at 300○F for approximately 4 hours.